After being identified to be owned by Kola Aluko, Diezani's ally, a N16 billion apartment is set to be auctioned. 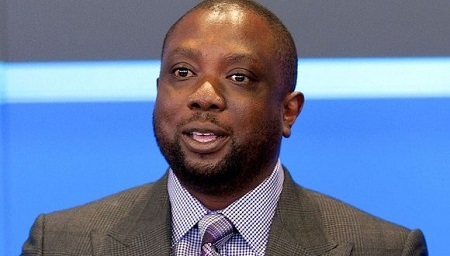 Nigerian energy businessman Kola Aluko, declared wanted by the EFCC, has been identified as the owner of Apartment 79, a penthouse apartment in One57, one of New York City’s most expensive residential buildings, NAN reports. However, the apartment would be sold to the highest bidder by a Luxembourg based Banque Havilland, in a foreclosure auction in July, the New York Post reported. The penthouse sale is seen as the most expensive foreclosure in New York City. Aluko, 48, is believed to be hiding out on his yacht, which he rented to Jay Z and Beyoncé in 2015 for $900,000 a week. The energy businessman, a friend of stars such as Jay Z and Jamie Foxx, has not been seen for a while, which has sparked rumours that he is hiding away on his yacht, which was last registered in the Bahamas in May. Mr. Aluko was reportedly last seen in Hong Kong in May and his yacht is currently in the Bahamas, according to the report. His bank has also listed the yacht, the Galactica Star, as collateral in the foreclosure, but the yacht is ‘out of range’ at the moment. Mr. Aluko rented the Galactica Star to Jay Z and Beyoncé in 2015 for $900,000 a week and allegedly showed up at the Ja Rule Fyre Festival in the Bahamas in late April with his yacht. The businessman is also close friends with Leonardo DiCaprio and made a large donation to DiCaprio’s environmental charity as well as attended the actor’s birthday party in New York City in 2013. The energy tycoon sold a 2.4-acre estate in Montecito, California, to Gwyneth Paltrow for an undermarket $4.9 million. In 2012, he bought an 11,478-square-foot house in Bel Air for $24.5 million, then sold the property in 2016 for $21.5 million. He also owns a home in Beverly Hills that was also purchased in 2012 for $14.7 million. Mr. Aluko is also avoiding Nigerian authorities who tried to freeze his asset in February as part of a money-laundering probe that also involves ex-Petroleum Minister Diezani Alison-Madueke, an ally of Mr. Aluko. Apartment 79 was sold to a Aluko in December 2014 for $50.9 million, making it the eighth most expensive unit in the building, according to New York City property records. Less than a year later however, he took out a $35.5 million mortgage from Banque Havilland in Luxembourg to help pay for the apartment. When Mr. Aluko failed to pay the loan back a year later, the bank took possession of the 6,420-square-foot apartment, according to court documents. Now the bank is planning to auction off the four-bedroom apartment on July 19 to regain the mortgage plus interest. “It’s probably the most-expensive foreclosure we’ve ever seen in luxury development. I don’t know of a foreclosure that’s larger than that,” Donna Olshan, president of high-end Manhattan brokerage Olshan Realty Inc., told newsmen. One57 was built by Extell Development Co. and was the tallest residential building in Manhattan until 432 Park Ave was completed a few months later. Construction started on the building in 2009 and finished in 2014, creating a trend of similar ultra-luxury high-rises on 57th street, which has now been coined ‘Billionaire’s Row’. Amenities in the building include a 24-hour doorman and concierge, fitness centre, yoga studio, private dining room, catering kitchen, library, valet service and on-site parking.